Prior to the missionaries arriving in the islands, the flat plain just south of the village of Honolulu was a barren, windswept dust bowl – little more than a desert. However, in the midst of this sun-parched land there was an oasis, a spring whose waters were reserved exclusively for the land’s high chiefs and chiefesses. One such noble who frequented this pool was the chiefess Ha‘o. Eventually these waters, and the surrounding land, came to be known as Ka Wai a Ha‘o – the freshwater pool of Ha‘o. In 1820, the first missionaries arrived in Hawai‘i, and found themselves well-accepted by royalty as well as the general populace. They were granted land at Kawaiaha‘o for the purpose of establishing their residence and church. The missionaries, less the group left on the Big Island, landed at Honolulu on April 19, 1820. Four days later, Hiram Bingham, the leader of the group, preached the first formal Protestant sermon in the islands. Initial services were in thatched structures. Later, a more permanent church was built. The church, constructed between 1836 and 1842, was in the New England style of the Hawaiian missionary and has been restored and altered several times since first erected. The “Kauikeaouli clock,” donated by King Kamehameha III in 1850, still tolls the hours to this day. Revered as the Protestant “mother church” and often called “the Westminster Abbey of Hawai‘i” this structure is an outgrowth of the original Mission Church founded in Boston and is the first foreign church on O‘ahu (1820). Within its walls the kingdom’s royalty prayed, sang hymns, were married, christened their children and finally laid in state. As the state church, it was the scene of many celebrated events associated with the Hawaiian Kingdom – inaugurations, funerals, weddings, thanksgiving ceremonies. The “Stone Church,” as it came to be known, is in fact not built of stone, but of giant slabs of coral hewn from ocean reefs. These slabs had to be quarried from under water; each weighed more than 1,000 pounds. Natives dove 10 to 20 feet to hand-chisel these pieces from the reef, then raised them to the surface, loaded some 14,000 of the slabs into canoes and ferried them to shore. Following five years of construction, The Stone Church was ready for dedication ceremonies on July 21, 1842. The grounds of Kawaiaha‘o overflowed with 4,000 to 5,000 faithful worshippers. King Kamehameha III, who contributed generously to the fund to build the church, attended the service. Kawaiaha‘o Church was designed and founded by its first pastor, Hiram Bingham, my great-great-great grandfather. 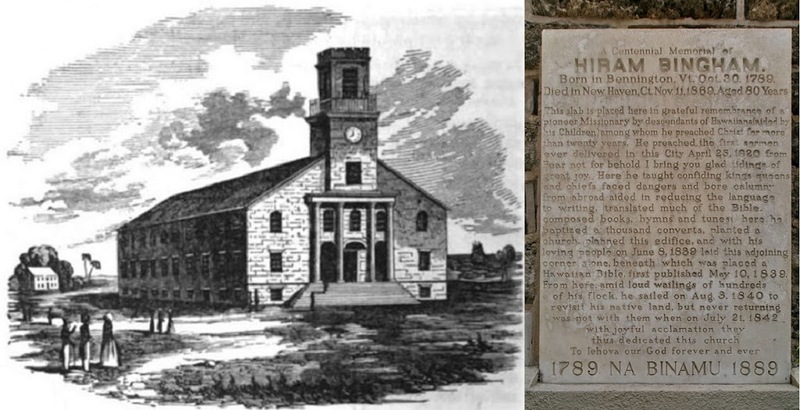 Hiram left the islands on August 3, 1840 and never saw the completed church. Kawaiaha‘o Church is listed on the state and national registers of historic sites. Kawaiaha‘o Church continues to serve as a center of worship for Hawai‘i’s people, with services conducted every Sunday in Hawaiian and English. Approximately 85% of the services are in English; at least one song and the Lord’s Prayer (as a congregation) are in Hawaiian. The image shows Kawaiaha‘o Church, as drawn by Bingham, and a centennial memorial to Hiram Bingham, mounted on its entrance wall.